The quick solution to running out of growing space. The Mushroom Incubating/Fruiting Kit comes with a powerful 200 Watt Aquarium Heater that will allow you to keep ideal growing temperatures even in rooms as cold as 50 degrees! Fully adjustable from temperatures 65-88 degrees! The compact size is plenty of room for 12 jars or 6 spawn bags. The mini-digital thermometer/hygrometer can be mounted anywhere in the kit to easily view the current temperature or humidity levels. This kit includes everything you need to dry your mushrooms perfectly! There is no better way to prepare them for storage than to dry and preserve them the right way. Our Easy Drying kit combines two of the best desiccants we have tested for drying mushrooms. Guaranteed perfect results every time even in the most humid climates! This drying kit can be used over and over! Dry pounds! 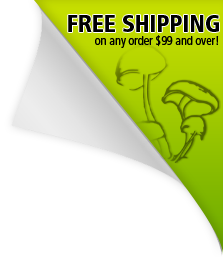 This hydroponic humidifier is designed specifically to create the perfect humidity levels for mushroom growing. This unit requires an aquarium air pump for use. Perfect for replacing your existing unit or adding to an existing air pump system. Replacement HEPA filter hoses for use with our Hydroponic Humidifier system. This digital thermometer is perfect for monitoring the incubation and fruiting temperatures of your mushroom growing setup. The large easy to read screen displays temperature and humidity levels at the same time. The HTC-1 has been popular among growers for years and is the go-to model for easy accurate readings. This kit includes everything you need to dry a large amount of mushrooms perfectly. There is no better way to prepare your mushrooms for storage than to dry them the right way without the use of heat. Our Jumbo Drying Kit is easy to use and combines two of the best desiccants we have tested for drying mushrooms. We recommend our Jumbo Drying kit for anyone growing 18 Jars or more, two or more spawn bags or any bulk grow. This 21"x 11" under-tank style heating mat uses liquid graphite to evenly heat the surface with no hot spots! Traditional heating pads use wires, which can lead to uneven heating and hot spots. This powerful heater only uses 28 watts of electricity but is equivalent to 200 Watts of heat. The adjustable dial allows for precise sustainable temperature control.